The chemical element carbon (C) is a building block of life. It is essential for energy supply, technology and all things produced and consumed by man. The global society has a “carbon economy”. The majority of useful carbon compounds emanate from car-bon dioxide (CO2), once incorporated into biomass via photosynthesis. On a geological time scale, fossil biomass was converted to coal, oil and natural gas. At the end of their life cycle, the carbon atoms inside man-made goods are put back in the form of CO2 that ends up in the atmosphere. The excessive CO2 emissions by anthropogenic activity is in fact a timing issue. It takes its most extreme form in the use of fossil fuels to generate energy. Fossil carbon compounds whose formation took up millions of years, are converted in milliseconds into CO2, discharged into the atmosphere. The natural CO2 capture mechanisms work too slowly to compensate for rising CO2 emissions. The indispensable transition to CO2-neutral human activity on earth involves tremendous scien-tific and technological challenges. The current generation has the overwhelming responsibility to not only stop the ongoing increase in CO2 concentration in the atmosphere, but also to reduce it to a lower acceptable level in order to restrain climate change caused by greenhouse gases. There are several scenarios that offer a possible solution to reducing CO2 emissions. The Royal Flemish Academy of Belgium for Science and the Arts offers the voice of the chemical sciences in this debate and tries to identify realistic chemical solutions. Because of its vital role the chemical element carbon will keep its prominent place in the economy. 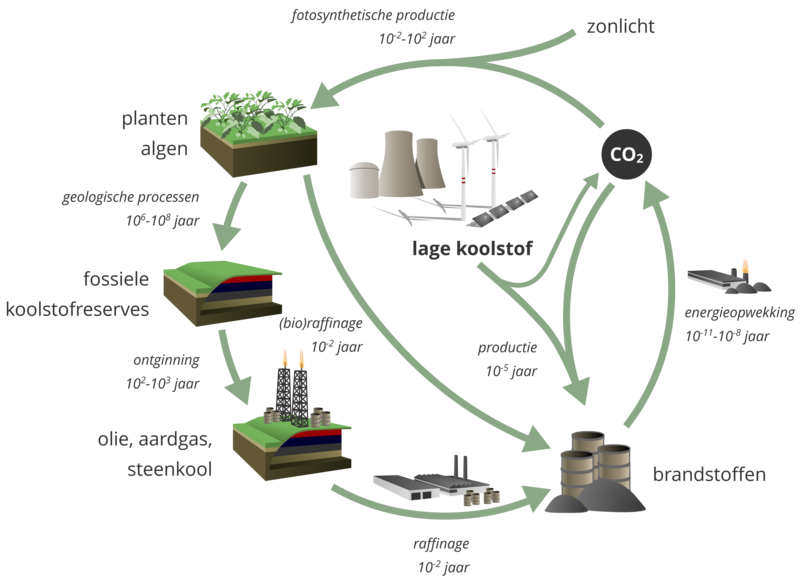 Rather than to eliminate carbon, the objective is to realize a CO2 neutral world within the foreseeable future. In this position paper, a path towards this goal is proposed. Common misconceptions are refuted. The complex problem of rising CO2 concentrations in the atmosphere is reduced to its scientific essence in order to find solutions. CO2 emissions can be divided in those from point sources and diffuse sources, each responsible for about half the emissions. - Point sources are the chimneys of large installations such as power plants, refin-eries, blast furnaces, cement kilns and incinerators, of which there exist about 220 in Flanders. The capture of CO2 from point sources and the conversion of this CO2 to fuels, chemicals and materials with fast catalytic processes is becom-ing technically possible. Some emerging technologies are already being demon-strated on an industrial scale. Others are still at laboratory or pilot scale. Their implementation can be realized in a time window ranging from 5 to 20 years, subject to the necessary investment in scientific research and development. The massive amounts of energy needed for these processes of capture and conversion of CO2 must come from low-carbon energy sources, mainly from the sun, but also from tidal energy, geothermal energy or nuclear energy. Synthetic methane gas, that can be formed from CO2 and hydrogen gas, is an attractive renewable energy source for which a distribution system currently exists. Methanol offers advantages as a liquid fuel and is also a building block for the chemical industry, as via catalysis numerous chemicals and plastics can be produced. - CO2 emissions from diffuse sources on the other hand are a difficult problem, and CO2 emissions from transport by road, water and air are so in particular. Technological breakthroughs for CO2 capture are missing for these sources. It is impossible to ban carbon from the entire energy supply of mankind with the cur-rent technological knowledge, but a transition to a mixed carbon / hydrogen / electron economy can reduce CO2 emissions by the transport sector significantly. The life cycle of the hydrogen atoms in chemical compounds ends up with the formation of water, which is not a threat. This famous statement by John F. Kennedy in his inaugural speech as president of the United States of America (1961) can be appropriately cited here, given the threat to hu-manity. Back then it was freedom being threatened. The current and the next generation cannot ignore the CO2 problem and should take up a responsible attitude.